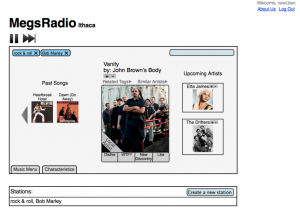 MegsRadio (circa 2011) – The first prototype. Since my days as an undergrad in the late 90s, my research focus has been on music technology. Much of the reason for this is because I grew up in Ithaca where there is an active local music scene to tons of extremely talented musicians. I loved going to shows, spending time at festivals, and performing with my own high school rock band. So when I returned to Ithaca in 2010, I turned my attention to using my music technology skills to build a personalized Internet radio player that would help people discover this local music scene. MegsRadio has been a labor of love of mine for the past eight years. We built our first prototype back in 2011 and then launched our a full version in 2013. We then burned it to the grounds and started from scratch with the express goal of creating “professional-grade” version with support for web and mobile apps. This was launched three years later in 2016 as an iOS app and web app. Since then, we have worked hard to improve the backend playlist algorithm and develop new Android and web apps. 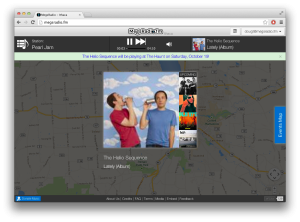 MegsRadio (circa 2013) – The first complete web app. I have loved working on MegsRadio with over 25 passionate students for the past 8 years. I have learned a lot about web programming & software engineering, marketing & outreach, project management & fundraising. I have enjoyed talking about MegsRadio with at music shows and festivals. And every time I see an artist giving us a shoutout from the stage or on social media, I get a little kick of excitement. However, MegsRadio has failed to establish a consistent user base. We have spent seven summers developing software and three falls active promoting our apps. Each time we have “launched” MegsRadio we see about 30-50 daily users for a week or two. Sadly, a month or two later almost nobody is using our free-to-use and commercial-free service. 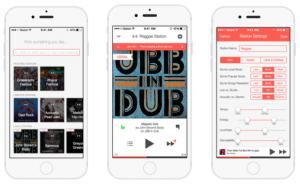 MegsRadio (circa 2016) – The first mobile app. As such, we are interested in pivoting MegsRadio away from a passive personalized radio model and towards an active event recommendation service. To this end, we are designing a new interactive experience that helps users to quickly find shows that are of interest and then allows them to listen to music that will help provide context for the show. We are also going to develop our “brand” to be more aggressive about promoting local music. Just like folks should “shop local” or “eat local”, people should also “listen local.” We will work hard to make sure this happens. 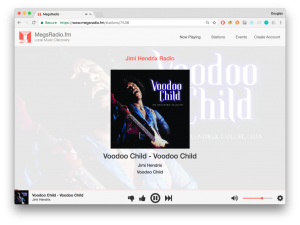 MegsRadio (circa 2017) – The latest web app.